This picture shows the tip of a maple leaf. Note that not all leaves can be processed this way. Let the leaves simmer for 1-2 hours. Periodically check the leaves by carefully rubbing them between your fingers. They should start to feel slimy and you should be able to rub off some of the surface plant tissue. Carefully lift out the leaves. They are now very delicate and they tear easily. Put one leaf on one dish each. Add a bit of water to the leaf on the dish. Use the brush to carfully remove the soft plant tissue of the leaf. The brush presses the leaf against the plate. This gives the leaf stability. Use the fingers of the other hand to prevent the leaf from moving while brushing. The leaf veins start to appear. Carefully turn the leaf around and remove the plant tissue on the other side as well. The water of the dish starts to accumulate plant tissue and should be exchanged periodically. 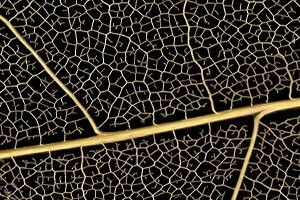 You now have a delicate network of leaf veins on the plate. Lift it out and place it flat on tissue paper to remove most of the liquid. Press the leaf veins between layers of tissue paper and a book. Otherwise there is the danger that the leaf will warp during the drying process. 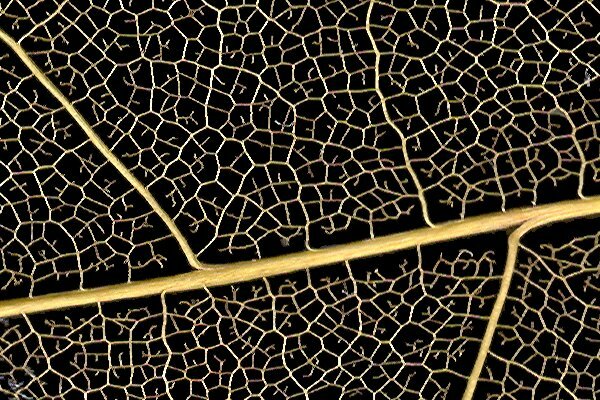 Observe the leaf veins using a stereo microscope. They can also be observed using a compound microscope using a low magnification. Alternatively it is possible to scan the leaf veins with a flat-bed scanner. Make a quality check. Observe any soft leaf material that has not been removed. Observe any tears and breaks in the leaf veins that were caused by brushing too forcefully. Press the leaf between two books. Place the leaved into a solution of washing soda (pH 11 – don’t let children do this!) until they become pulpy and the soft material starts to come off. Rinse the leaves and brush off the soft material with a soft brush. Students may also attempt to remove the soft tissue directly under the stereo microscope. In this case the leaf should be placed in a petri dish. 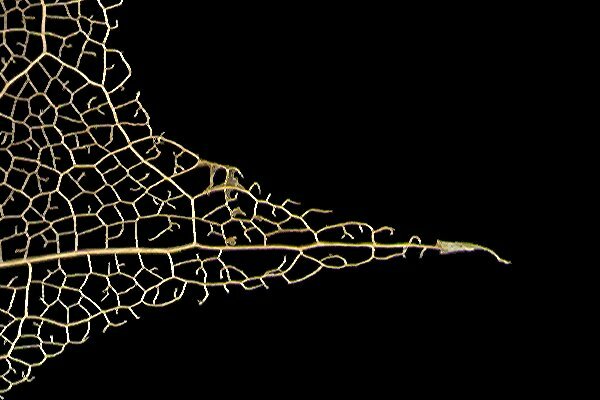 The cleaned leaf veins can be brightened by washing them in pure alcohol. This removes remains of the chlorophyll. The alcohol also removes water and the network of veins will shrink. Wash the veins in pure water after the alcohol treatment to restore the original size. The network of veins can be scanned using a flatbed scanner using high resolution. This also visualizes small structures. A dark background gives a nice contrast. Troubleshooting: Question: It is not possible to remove the soft tissue of the leaf. Answer: Some leaves can be boiled for hours and still not macerate. Oak leaves are completely unsuitable for this preparatory technique. Try out a variety of different leafs. Alternatively, the leaf may not have been boiled long enough.